Hasbro sent out photos and details for their newly revealed Star Wars toy from Toy Fair 2018. Check out the press release below and the photos after the jump. (Ages 4 years & up/Approx. Retail Price: $29.99/Available: Spring 2018) Choose to learn the ways of the light side or dark side with the FORCE MASTER LIGHTSABER! Fans can switch between four Jedi and Sith masters to activate red, blue, green, or purple blades. Listen as DARTH VADER, OBI-WAN KENOBI, YODA, and MACE WINDU guide young Padawans as they battle. Features iconic light and sound effects, including 24 phrases. Compatible with BLADEBUILDERS LIGHTSABER components, each sold separately. Includes lightsaber and connector. Requires 3 AA batteries, not included. Available at most major retailers. (Ages 6 years & up/Approx. Retail Price: $29.99/Available: Spring 2018) Every smuggler needs a NERF GLOWSTRIKE HAN SOLO Blaster! Features a 4-dart internal clip with light and sound effects inspired by the movie to fire darts up to 70 feet away. Keep the fun going from day to dusk with GLOWSTRIKE technology light effects and glow-in-the-dark darts. Includes 4 Elite GLOWSTRIKE darts. Requires 1 AA battery, included. Available at most major retailers. (Ages 4 years & up/Approx. Retail Price: $129.99/Available: Fall 2018) Kids can imagine taking on the galaxy with their very own Wookiee sidekick! The STAR WARS ULTIMATE CO-PILOT CHEWIE stands 16 inches tall and features more than 100 sound and motion combinations. With signature Wookiee-talk back interaction, the ULTIMATE CO-PILOT CHEWIE responds to external movements and sounds. Make a noise and the ULTIMATE CO-PILOT CHEWIE will roar back! Fans can enjoy everything from naptime to pretending to fly with their Wookiee sidekick. The ULTIMATE CO-PILOT CHEWIE features poseable legs and can respond with a variety of facial expressions for fun surprises. Includes iconic bandolier and satchel. Requires 4 AA batteries, not included. Available at most major retailers. (Ages 4 years & up/Approx. Retail Price: $2.99/Available: Now) Collect the galaxy of fan-favorite characters with the STAR WARS MICRO FORCE Blind Bags Assortment. Each figure has a squishable feel and pose, creating an exciting new way to bring iconic STAR WARS scenes to life! These stylized, movieinspired micro collectibles include iconic characters such as REY, FINN, DARTH VADER, LUKE SKYWALKER, PRINCESS LEIA ORGANA, HAN SOLO, CHEWBACCA, YODA, R2-D2, and more. Each blind bag includes two figures and a collector card. Each sold separately. Available at most major retailers and on HasbroToyShop.com. 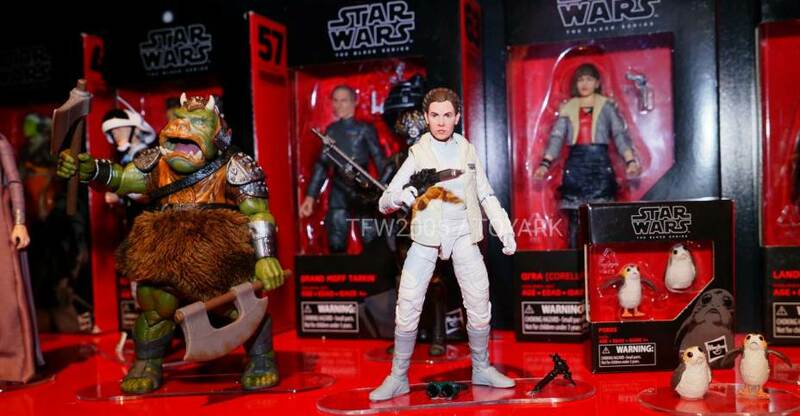 Check out all the new Comic Con 2014 Star Wars Black Series 3.75″ images after the jump. 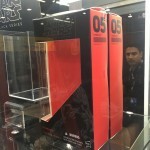 Sideshow has posted up a pre-order for a new Star Wars Sixth Scale Figure. 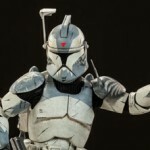 They are releasing a Clone Wars Clone Commander Wolffe. Sideshow Collectibles presents the Clone Commander Wolffe Sixth Scale Figure. 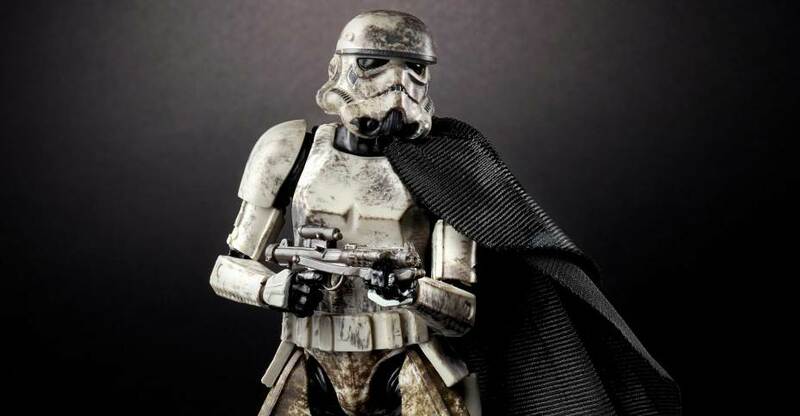 Inspired by his appearances in Star Wars – The Clone Wars, the leader of the 104th Battalion’s famed Wolfpack joins the ranks of Sideshow’s Militaries of Star Wars. CC-3636 comes loaded with four interchangeable heads, a complete arsenal, and a full range of articulation. Check out a gallery of the figure after the jump.